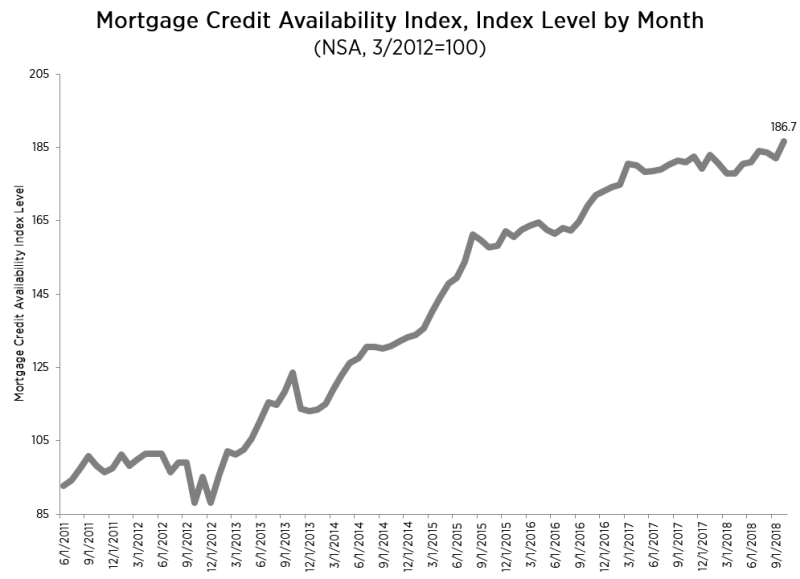 The ease of access to mortgage credit rose in October according to the Mortgage Credit Availability Index. An increase in the Index, a product of the Mortgage Bankers Association (MBA), indicates that credit standards are loosening while a decline is a sign that standards are tightening. The 2.5 percent change in October took the composite index to 186.7. Among its components the Conventional MCAI, which itself is composed of two indices, gained 5.5 percent. One of its sub-measures, the Jumbo MCAI, surged by 6.3 percent while the other, the Conforming MCAI was 4.6 percent higher. Moderating the overall gains, the Government MCAI ticked down 0.4 percent. "Credit availability increased in October, driven largely by an expansion in the supply of conventional credit, while government credit fell slightly over the month," said Joel Kan, MBA's associate vice president of economic and industry forecasting. "Reversing a trend from last month, lenders made more conventional and low down payment programs available to prospective borrowers. This increase in supply was likely in response to a growing number of first-time home buyers in the market, as home price appreciation has slowed and wage growth has picked up. Jumbo credit availability also expanded last month, with the jumbo index increasing again to its highest level since the survey began."